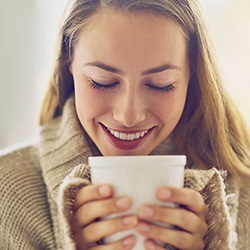 Do you enjoy a cup (or 3) of coffee at the start of each day? How about the occasional glass of red wine or a snack of raspberries? Unfortunately, all of these, in addition to diet, aging, and genetics, can stain your teeth and make them look dull and discolored over time. It’s no secret: everybody is drawn to white teeth, and they are one of the strongest social signifiers in our society. Studies have shown that when someone looks at a person with a bright, perfect smile, words like attractive, intelligent, and professional quickly come to mind. Wouldn’t it be great to have people think that about you just because of your teeth? If you’re looking to dramatically whiten your smile, your answer isn’t your toothbrush. Your home routine is great for maintaining your current shade but can do little to improve it (and that includes so-called “whitening” toothpaste, which can be quite abrasive). 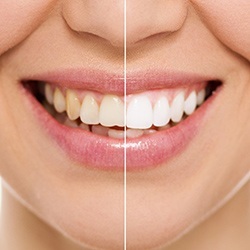 The only way to make your teeth truly dazzle is with professional take-home teeth-whitening from Chaska Dental Center. Unlike the whitening kits you see in the store, our take-home kits use professional grade products you can only get through your dentist in Chaska. This not only gives you a better result but one that lasts much longer and needs less frequent touch-ups. Each one of our kits is specially crafted for you, and this will help ensure your treatment is not only effective but comfortable as well. Two quick visits to our office will send you home with custom-made mouth trays and a powerful whitening gel. 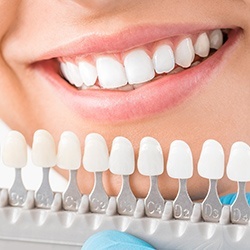 You simply wear the trays with the gel as directed to make your teeth appear up to 8 shades whiter. The gel attacks stains by breaking the bonds that hold them together, exposing your teeth to fresh oxygen, letting their whiteness shine through. After that, simple brushing and flossing can help maintain the color for months. You can even use the kit for the occasional touch-up, and this will help your new smile last for years. However, if you don’t want to commit to the custom trays quite yet, you can try our whitening strips first. They are easy to use and can offer a jump start on whitening your smile. Simply place one strip on your top teeth and one on your bottom teeth and follow the instructions we give you at the clinic. Before you know it, you’re on your way to a brighter smile! We want you to feel pride the next time you look in the mirror, and certainty during your next job interview, special event, or date. It can all come from a smile you’re eager to show off, and if you’re ready, you can start getting one today. A new, sparkling smile is waiting for you—all you have to do is call us today.